On May 8, 1945 Nazi-Germany signed a document of unconditional surrender in front of representatives of the three Western Allies (USA, UK and France). On May 9 it was signed in Berlin in the presence of the representatives of the Soviet Union. With the end of World War II in Europe the Holocaust, the greatest crime in human history, finally came to a halt. 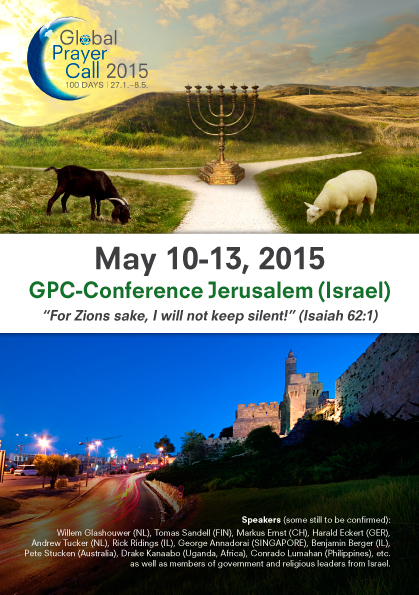 “For Zions sake, I will not keep silent!” (Isaiah 62:1) is the Biblical motto of the Global Prayer Day on May 8/9 2015 – as well as the GPC-Conference in Jerusalem, Israel on May 10-13, 2015. On May 8, 1945 (Russia: May 9) the surrender of Nazi-Germany to the Allied Forces was officially ratified. World War II in Europe came to an end. And most importantly, from a Jewish point of view, the Holocaust was over. Nearly half of the 13 Million Jews living in Europe in 1938 had perished. The rest of them barely escaped with their lives, often under the most traumatic of circumstances. Today, Israel is again isolated, terrorized and demonized by antisemitic forces. How are the nations of the world responding? Often in ignorance, with indifference, knowingly turning a blind eye and sometimes even sympathizing with the sworn enemies of Israel. Could the parallels with the situation of the Jews of Germany and Austria in 1938 be any more striking? The bible talks about a “valley of decision” (Joel, 3:14) and about the judgment of nations as either “sheep” or “goat” nations at the return of Jesus (Matt. 25:31-33) based on Genesis 12:1-3. The nations which bless Israel will be blessed. The nations which curse Israel will be cursed. The GPC-book “Israel, the Nations and the Valley of Decision” deals with this topic in greater detail (see right column). How will your nation fare in this end-time judgment scenario? Are you prepared to stand in the gap? 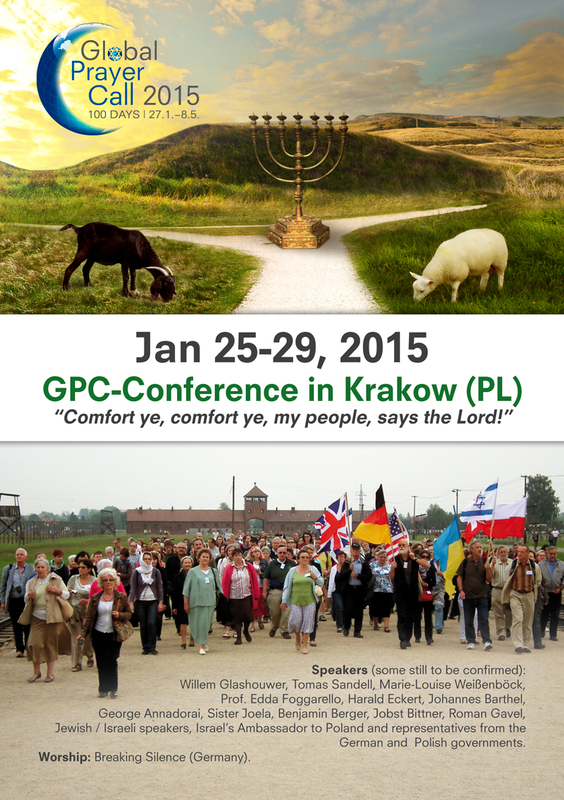 “Comfort ye, comfort ye, my people, says the Lord!” is the central theme of the GPC-Conference in Krakow/Auschwitz (Poland), Jan. 25-29, 2015. In this deeply moving verse from Isaiah 40:1, the God of Israel exhorts us as non-Jewish believers to comfort his people, which has gone through so much suffering. On Jan. 27, 1945, the Auschwitz Concentration Camp, where more than one million Jews were systematically and brutally killed within only 3 years, was liberated. Auschwitz came to symbolize the Holocaust, during which 6 Million of the 13 Million Jews living in Europe at that time perished between 1940 and 1945 – exactly 70 years ago. In 2005-2006 the European Union as well as the United Nations established January 27th as the official Holocaust memorial day. Hatred of the Jews within the Christian Church in Europe (both Catholic and Protestant) was a major factor preparing the way for the Holocaust. Starting with the early church fathers and carried on by the great reformer, Martin Luther, replacement theology, whose premise is that God had rejected the Jews because they rejected Jesus, had permeated the European Church. Not only the church, but also most European nations were united in their dislike, mistrust, even hatred of the Jewish people. Most others were simply indifferent to their plight. These attitudes were particularly strong in Germany and helped usher Hitler into power and pave the way for his “final solution” – the Holocaust.